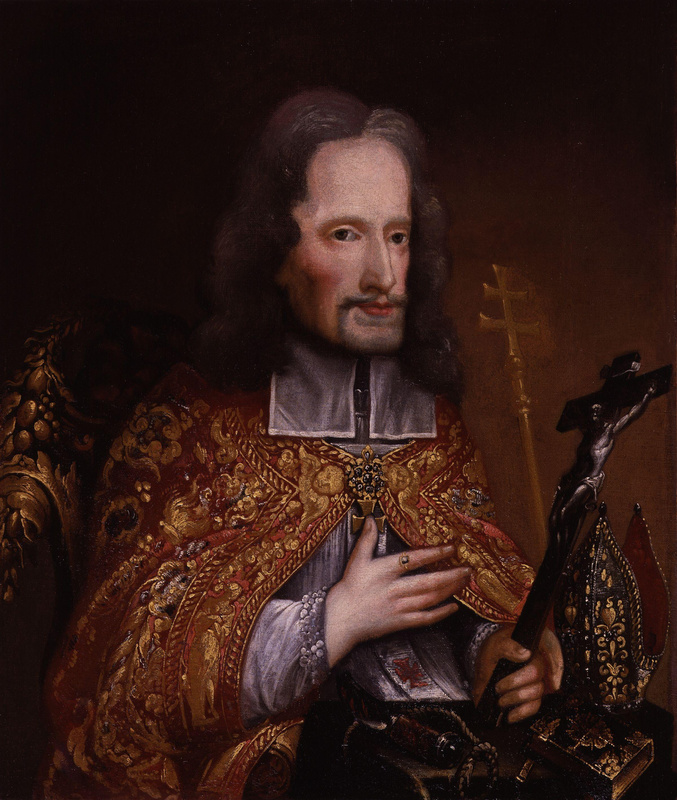 Jul 1 – Naomh Oileabhéar Pluincéad/St Oliver Plunkett, (1625-1681) – Archbishop of Armagh, Primate of All Ireland, Martyr, Patron Saint of Peace & Reconciliation in Ireland | ADULT CATECHESIS & CHRISTIAN RELIGIOUS LITERACY IN THE ROMAN CATHOLIC TRADITION: hosting ONLY True Christians!! !, or "How to think Catholic!!" Oliver Plunkett was born in Loughcrew in County Meath, Ireland on November 1, 1629. In 1647, he went to study for the priesthood at the Jesuit Irish College in Rome. On January 1, 1654, he was ordained a priest in the Propaganda College in Rome. Meanwhile, the Cromwellian conquest of Ireland (1649–53) had defeated the Roman Catholic cause in Ireland and, in the aftermath, the public practice of Roman Catholicism was banned and Roman Catholic clergy were executed. As a result, it was impossible for Plunkett to return to Ireland for many years. He petitioned to remain in Rome and, in 1657, became a professor of theology. He became the Irish bishops’ representative in Rome. Throughout the period of the Commonwealth and the first years of Charles II’s reign, he successfully pleaded the cause of the Irish Roman Church, and also served as theological professor at the College of Propaganda Fide. At the Congregation of Propaganda Fide on 9 July 1669, he was appointed Archbishop of Armagh, the Irish primatial see, and was consecrated on 30 November at Ghent by the Bishop of Ghent. He eventually set foot on Irish soil again on 7 March 1670, as the English Restoration of 1660 had started on a tolerant basis. The pallium was granted him in the Consistory of 28 July 1670. Archbishop Plunkett soon established himself as a man of peace and, with religious fervor, set about visiting his people, establishing schools, ordaining priests, and confirming thousands. After arriving back in Ireland, he set about reorganizing the ravaged Roman Church and built schools both for the young and for clergy, whom he found ‘ignorant in moral theology and controversies’. He tackled drunkenness among the clergy, writing ‘Let us remove this defect from an Irish priest, and he will be a saint’. The Penal Laws had been relaxed in line with the Declaration of Breda in 1660 and he was able to establish a Jesuit College in Drogheda in 1670. A year later 150 students attended the college, no fewer than 40 of whom were Protestant, making this college the first integrated school in Ireland. His ministry was a successful one and he is said to have confirmed 48000 Catholics over a 4 year period. The British Dublin Government, especially under the Duke of Ormonde ( the Protestant son of Catholic parents) extended a generous measure of toleration to the Catholic hierarchy until the mid-1670s. On the enactment of the Test Act in 1673, to which Plunkett would not agree for doctrinal reasons, the college was levelled to the ground. Plunkett went into hiding, traveling only in disguise, and refused a government edict to register at a seaport to await passage into exile. For the next few years he was largely left in peace since the Dublin Government, except when put under pressure from London, preferred to leave the Catholic bishops alone. In 1678, the so-called Popish Plot, concocted in England by Titus Oates, led to further anti-Roman Catholicism. Archbishop Peter Talbot of Dublin was arrested, and Plunkett again went into hiding. The Privy Council in London was told he had plotted a French invasion.The moving spirit behind the campaign is said to have been Arthur Capell, 1st Earl of Essex, who had been Lord Lieutenant of Ireland and hoped to resume office by discrediting James Butler, 1st Duke of Ormonde. However, Essex was not normally thought to be a ruthless or unprincipled man and his later plea for mercy suggests that he had never intended that Plunkett should actually die. Despite being on the run and with a price on his head, Plunkett refused to leave his flock. He was arrested in Dublin in December 1679 and imprisoned in Dublin Castle, where he gave absolution to the dying Talbot. Plunkett was tried at Dundalk for conspiring against the state by allegedly plotting to bring 20,000 French soldiers into the country, and for levying a tax on his clergy to support 70,000 men for rebellion. Though this was unproven, some in government circles were worried about, and some used the excuse, that another rebellion was being planned. The Duke of Ormonde, aware that the Earl of Essex was using the crisis to undermine him, did not defend Plunkett in public. In private he made clear his belief in Plunkett’s innocence and his contempt for the informers against him: “silly drunken vagabonds… whom no schoolboy would trust to rob an orchard”. The English knew Oliver Plunkett would never be convicted in Ireland and had him moved to Newgate Prison, London. The first grand jury found no true bill, but he was not released. The second trial has generally been regarded as a serious miscarriage of justice; Gilbert Burnet, an eyewitness, had no doubt of the innocence of Plunkett, who he praised as a wise and sober man who had no aim but to live peacefully and tend to his congregation. Lord Campbell, writing of the judge, Sir Francis Pemberton, claimed it a disgrace to himself and his country. More recently the High Court judge Sir James Comyn called it a grave mistake: while Plunkett, by virtue of his office, was clearly guilty of “promoting the Catholic faith”, and may possibly have had some dealings with the French, there was never the slightest evidence that he had conspired against the King’s life. Plunkett was found guilty of high treason on June 1681 “for promoting the Roman faith,” and was condemned to death. Numerous pleas for mercy were made but Charles II, although himself a reputed Catholic, thought it too politically dangerous to spare Plunkett. The French Ambassador Paul Barillon conveyed a plea for mercy from his King: Charles said frankly that he knew Plunkett to be innocent, but the time was not right to take so bold a step. Essex, apparently realizing too late that his intrigues had led to the condemnation of an innocent man, made a similar plea: the King turned on him in fury, saying ” his blood be on your head- you could have saved him but would not, I would save him and dare not”. Plunkett’s many letters showed his determination not to abandon his people, but to remain a faithful shepherd. He thanked God “Who gave us the grace to suffer for the chair of Peter.” He was put on trial, and with the help of perjured witnesses, unable to bring his own from Ireland, and was sentenced to be hanged, drawn and quartered at Tyburn. Upon hearing sentence, he replied, “Deo Gratias!” With deep serenity of soul, he was prepared to die, calmly rebutting the charge of treason, refusing to save himself by giving false evidence against his brother bishops. Oliver Plunkett publicly forgave all those who were responsible for his death on July 1, 1681. His body was initially buried in two tin boxes next to five Jesuits who had died before in the courtyard of St Giles in the Fields church. The remains were exhumed in 1683 and moved to the Benedictine monastery at Lamspringe, near Hildesheim in Germany. 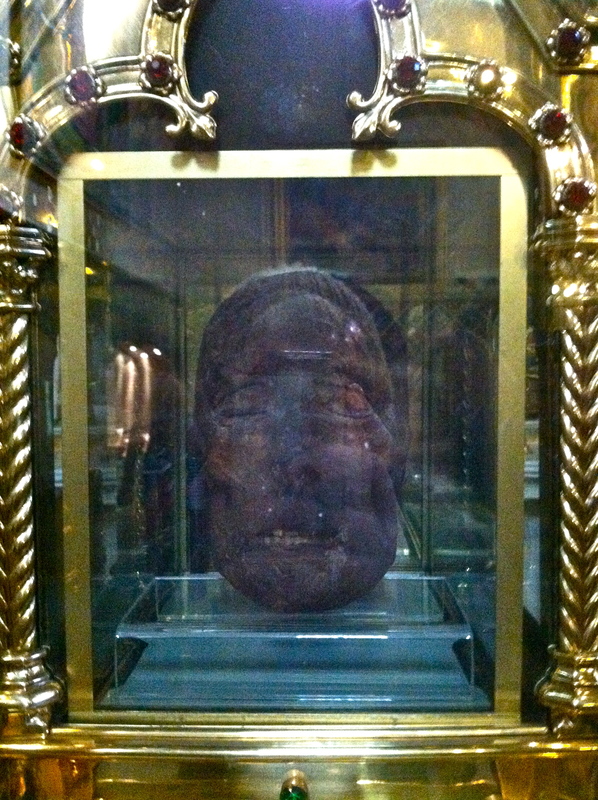 The head was brought to Rome, and from there to Armagh and eventually to Drogheda where, since 29 June 1921, it has rested in Saint Peter’s Church. Most of the body was brought to Downside Abbey, England, where the major part is located today, with some parts remaining at Lamspringe. 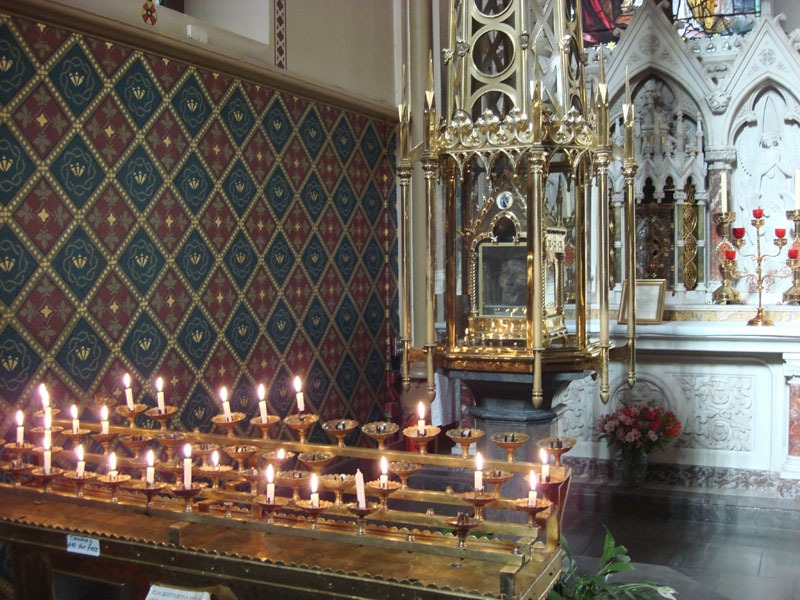 Some relics were brought to Ireland in May 1975, while others are in England, France, Germany, the United States, and Australia. 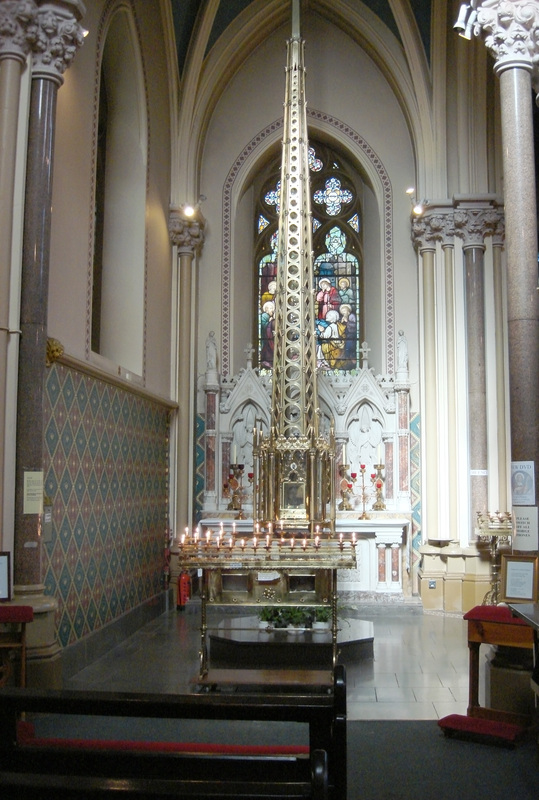 -The shrine of St. Oliver Plunkett at St. Peter’s Roman Catholic Church, Drogheda, Ireland. His head is just visible in the box under the spire. Pray for us and for Ireland. Amen. O for my God I sigh, All fear is lost. Welcome, o rope and knife! I now forgive, my life offer to Thee.